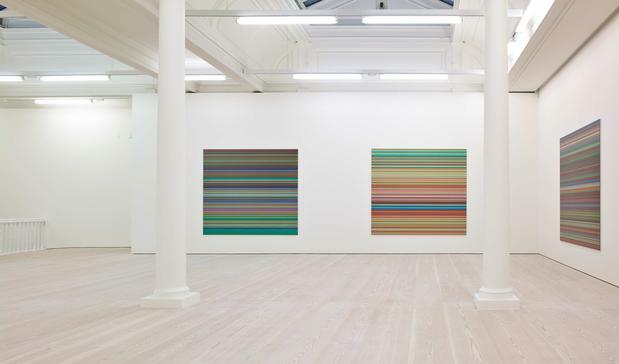 Marian Goodman is honoured to announce that an exhibition of new and recent works by Gerhard Richter will inaugurate her London gallery. 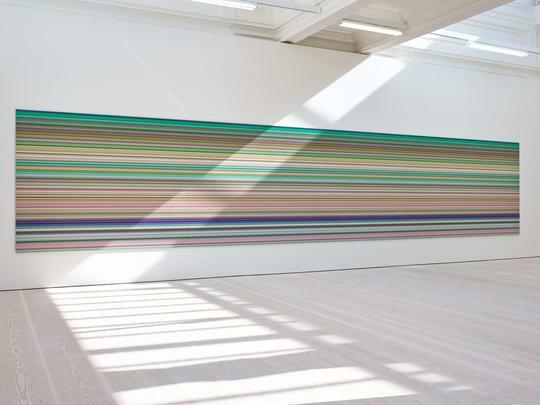 This will be Richter’s first gallery exhibition of this nature in London for nearly two decades. Consisting of over 40 works, with important bodies of new ‘Strip’, ‘Flow’ and ‘Doppelgrau’ paintings, the show will also include a large glass sculpture and a selection of key earlier pieces. 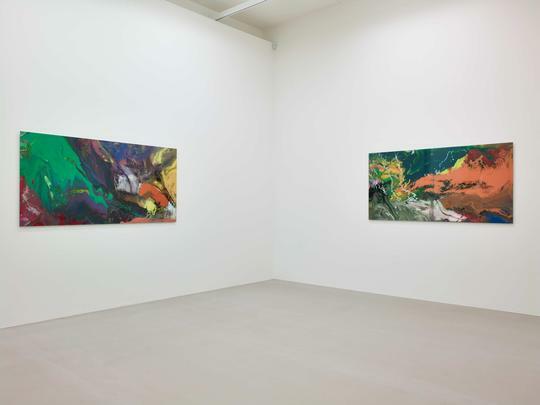 Another new territory through which Richter has reinvestigated his means of abstract painting, whilst undermining preconceptions of what it means for us to encounter them, are his ‘Flow’ paintings, a group of which are presented in one of the ground floor rooms of this exhibition. 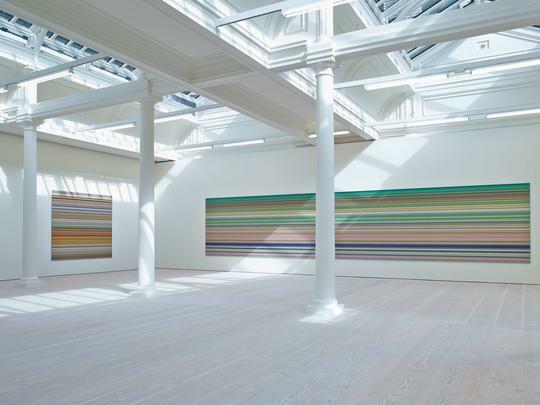 Their title refers to the gestural currents of enamel paint that have been frozen in motion at the moment Richter fixed a pane of glass directly to the surface of a painting in process on the floor – arresting a once fluid image at a precise chosen instance. His technique of pouring and manipulating paint captures a tension between chance versus the decisive gesture of the artist’s hand. And, while the glass face of each work serves to magnify the materiality of the paint, it also removes the element of direct tactility and undermines how immediacy of touch is typically supposed to facilitate an expressive connection between painter and viewer. 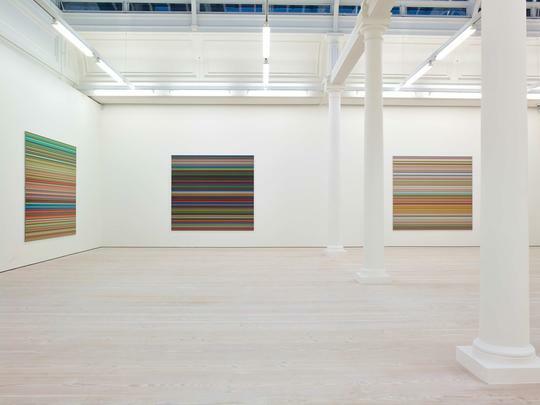 Richter leaves us instead with a smooth surface that not only distances us from subjective gesture, but also reflects ourselves and our surroundings. 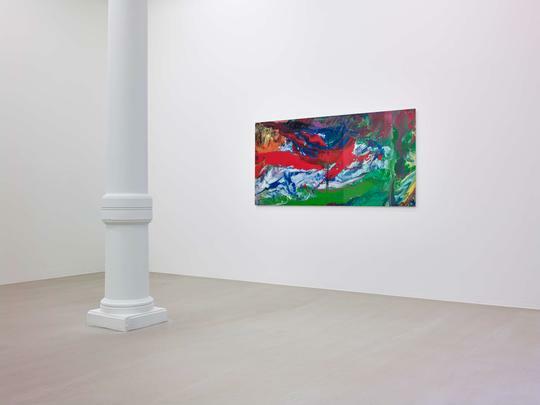 If the latter is intrinsic to the experience of his ‘Flow’ paintings, in the four large diptychs Richter has presented in the main ground floor space, reflection has been employed almost entirely in lieu of mark-making in itself, which opens up fundamentally different readings of the monochrome. 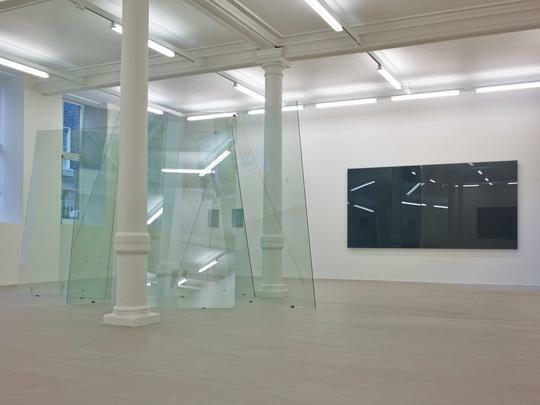 Each work juxtaposes two different shades of grey paint behind glass, hence their titles, ‘Doppelgrau [Double Grey]’. Sculptural as well as pictorial, each diptych is mounted to a support that projects the picture plane forward off the wall towards the viewer, hovering in space. Their fields of pure grey betray no gesture, so they and the reflections of the architectural space and spectators around them, mean we absorb both tangible spatial division and subtle differentiation of colour simultaneously. 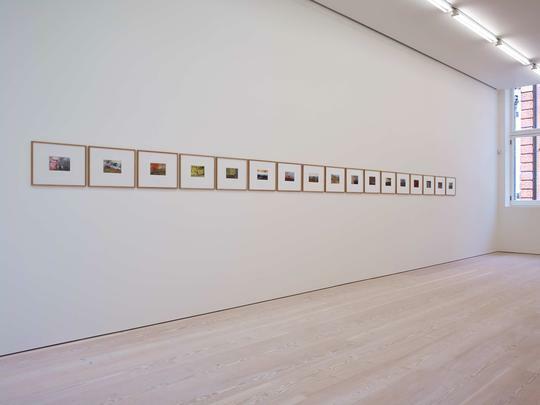 This series continues Richter’s nearly 50-year engagement with grey monochromes, an enduring fascination explained by his dictum that ‘Grey is the epitome of non-statement’. Richter has placed in the middle of this main room a monumental work entitled ‘7 Panes of Glass (House of Cards)’, one of the key new glass pieces Benjamin H. D. Buchloh describes as ‘The culmination of a lifelong preoccupation with the material… [and] an allegorical negation of the long and heroic history of material tropes within the painting and utopian architecture of the twentieth century’. Falling somewhere at the intersection of architecture, picture-making and sculpture, while defying categorization within each, it is constructed from sheets of glass propped against each other at angles that produce the illusion of shards slicing through, layering and dislocating light. 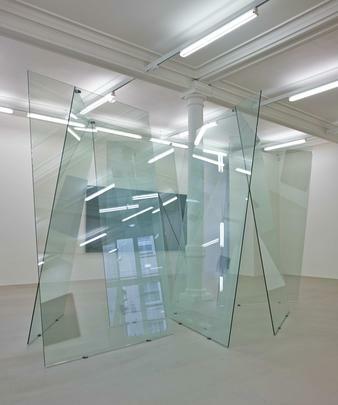 If all such Richter glass pieces belong to a lineage from his 1966 ‘Four Glass Panes’, this work in particular also recalls a trip he made to Greenland in 1972, initially inspired by Friedrich but during which Richter soon abandoned that romanticism for a fascination with the formal qualities of icebergs, and took whole volumes of photographs of them. 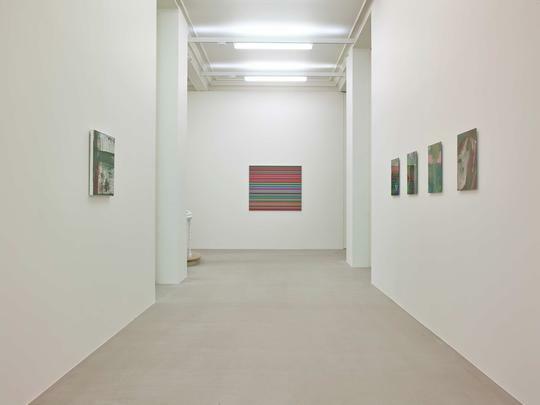 Gerhard Richter has recently been the subject of substantial solo exhibitions at the Fondation Beyeler, Basel; The Kunstmuseum Winterthur; and the Staatliche Kunstsammlung, Dresden. 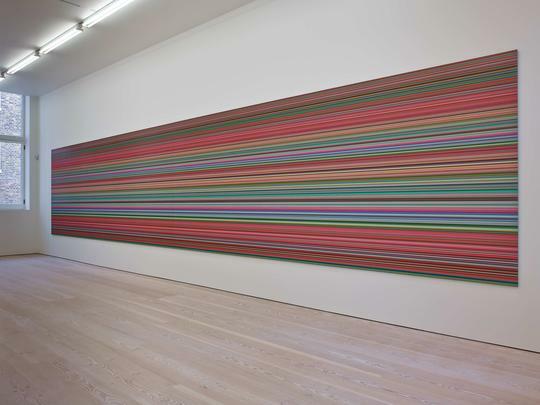 The artist’s work was last seen in London in ‘Gerhard Richter: Panorama’, a comprehensive retrospective at Tate Modern in 2011, which travelled to the Neue and Alte Nationalgalerie, Berlin, and The Centre Pompidou, Paris. A fully-illustrated, hardback catalogue with essays by Benjamin H. D. Buchloh, Dieter Schwarz, and Robert Storr will accompany the exhibition and is available at reception priced £40.00. The next exhibition in this space will be new work by Danh Vo, opening in January 2015. 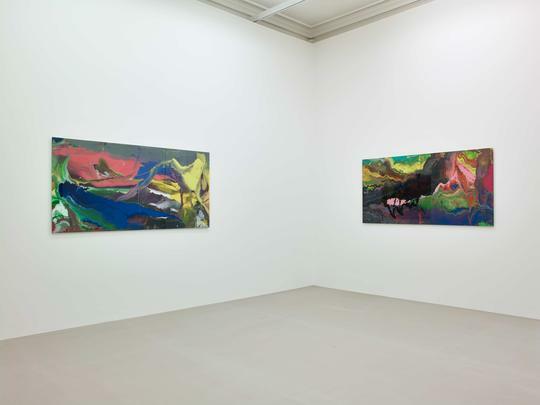 This will be Vo’s first solo show in London, and will precede his representation of Denmark in the 2015 Venice Biennale.